Millmerran Shire, an area of 4521 sq km, and generally 80 km south-west of Toowoomba, was amalgamated with Toowoomba City and six other shires in 2008 to form Toowoomba Regional Council. The Condamine River flowed through its northeast part, and the shire occupied parts of both the Condamine alluvial plain and the more westerly sandy loams of the central and western Darling Downs. 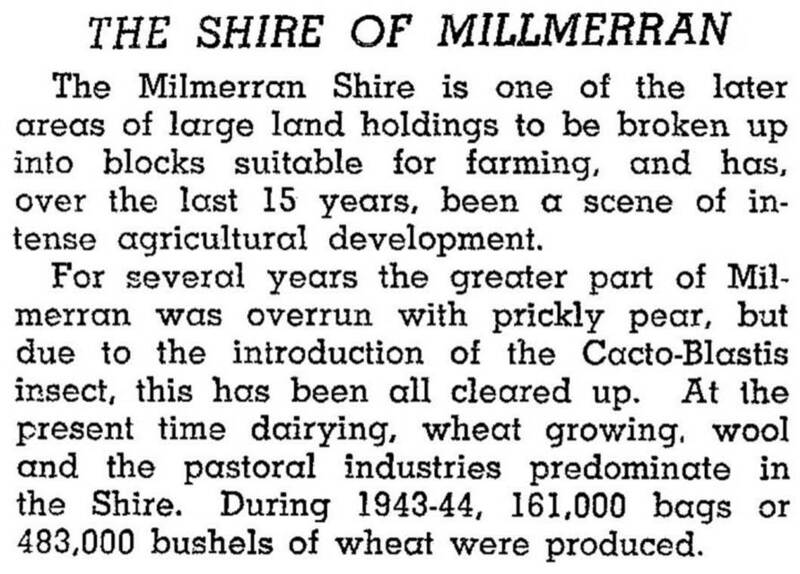 The Millmerran district was prime sheep production country from the days of the early pastoral runs - Cecil Plains (1841), Canning Creek (1840) and Yandilla (1841) - and was bypassed by the westwards railway lines from Toowoomba that were opened in 1868 (Dalby) and Inglewood (1907). Its two main towns, Millmerran and Cecil Plains, had insignificant population numbers in 1900. In 1993 the shire had 92,000 sheep and lambs, 42,000 beef cattle, only 135 dairy cattle and 31,000 pigs. Legumes, cotton and other field crops were grown on 10,000 ha, much of the land being irrigated. An open cut coal mine and power station 12 km south of Millmerran were opened in 2003.